The Myrtle Beach area and The Grand Strand are synonyms for a 60-mile stretch of the Atlantic coast that straddles the state line between North and South Carolina. The Grand Strand is actually four major golf destinations in one. At just about any other major American golf destination, you might have 15 or 20 courses from which to choose and those might be pretty spread out. In the Myrtle Beach area, we have four distinct regions that each have 22 or more courses usually located within a 15 minute drive of one another. Pick the adjacent places you want to play in a long weekend or full week of golf and then book your rooms nearby. Or decide on your accommodations first, then schedule tee times at you choice of layouts located in the immediate area. And don’t think that you have to compromise golf quality for vacation efficiency. 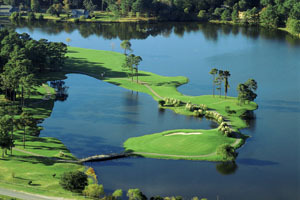 In each of the four Grand Strand regions, you’ll find one or more courses on Golf Digest’s list of “America’s 100 Greatest Public Courses” and at least seven rated at an “outstanding” four stars or above in “Best Places to Play.” All of the remainder that are listed earned a “very good” rating of three stars or more. That’s a lot of quality golf where your only short drives are to the next clubhouse. Golf packages booked in any one of the four regional destinations on The Grand Strand will have its own unique character and featured attractions. Pawleys Island, Litchfield Beach, Murrells Inlet, Garden City and Surfside Beach are resort communities located on the South Strand, along with 22 golf courses that include some of the Myrtle Beach area’s best. Pawleys and Litchfield are part of the historic Waccamaw Neck, a peninsula between the Atlantic Ocean and the Waccamaw River that was known as America’s “Rice Empire” in the 18th and 19th centuries. Murrells Inlet has its own unique history that’s still tied to the bountiful sea, while Garden City and Surfside Beach are oceanfront communities with scores of low-rise condominium properties that are spacious favorites for golf groups. The pace of life is a bit slower on the South Strand and the golf courses reflect that laid-back ambiance. 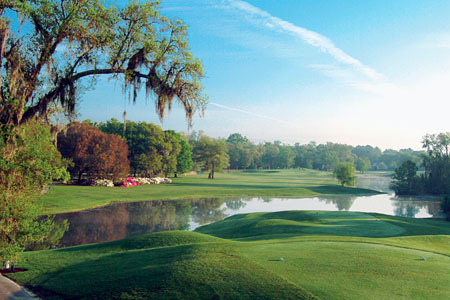 Most could fairly be called “Lowcountry-style” layouts, a label that suggests generally flat, sea-level terrain with marshlands often in play and fairways lined with moss-draped hardwoods. Quite a few South Strand courses are actually located on the sites of those former rice plantations and provide rich winter habitats for migrating waterfowl. Brookgreen Gardens is just such a site and home to America’s largest collection of outdoor sculpture in an awesomely beautiful setting with thousands of flowering plants. Murrells Inlet bills itself as “The Seafood Capitol of South Carolina” because of the fresh catch that arrives on its docks every day to be served up in the many local eateries every night. Scores of additional fine and casual restaurants are located from Pawleys to Surfside along Highway 17 South and Business 17. You’ll also find quaint specialty shops, big golf stores, fun miniature-golf centers, small arcades, full-service marinas and seaside fishing piers. The Central Strand region includes the famous oceanfront heart of the City of Myrtle Beach and the Highway 501 corridor west towards Conway. The majority of the Golf Holiday resort members are found here along the beach, including high-rise hotels that feature sweeping ocean views and complete vacation hosts that have on-site dining and other great amenities. As a result, golfers who visit in the “off-season” between September and April find an astounding variety of lodging choices at prices to satisfy every taste and budget. The Central Strand golf courses offer their own distinct variety. Dunes Club and Pine Lakes are the most historic sites in Myrtle Beach golf history, but along nearby Highway 501 and Bypass 17 are a collection of more than 20 modern classics. Most have been built during the “modern era” of Grand Strand golf that began in the early 1980s and many boast big-name architects who were given plenty of land to create their roomy designs. Some are “links-style” layouts with few trees and frequent mounding, while others could be called “parkland” courses because of the abundance of trees along the fairways. In addition to the wonderfully old-fashioned pavilions, arcades and novelty shops on Ocean Boulevard, the Central Strand region includes Broadway at the Beach, a complete entertainment complex that includes restaurants, nightclubs, retail stores, the SC Aquarium and an IMAX movie theater. There are also dozens of superb restaurants along Kings Highway, great shopping at the new Coastal Grand Mall and unbeatable deals at name-brand discount outlets and golf superstores. And the big oceanfront fishing piers can hook you up with all the equipment you need to rent for the day. The growing city of North Myrtle Beach, which incorporates several seaside communities, plus the towns of Little River and Longs, make up The North Strand area. The variety of available accommodations here ranges from oceanfront resorts and hotels to fully furnished and equipped high-rise condos by the sea to spacious golf villas and townhomes. The two dozen North Strand golf courses are an inviting mix of old and new, including a number of classic resort layouts built in the 1970s that have been lovingly maintained ever since. You’ll also find several courses located right along the Intracoastal Waterway and a number of others with water-and-woodland settings that defy singular classification. Some are Scottish-style links, while others bear the signatures of the game’s most respected designers. Restaurant Row is a highlight of any North Strand vacation, with miles of sit-down and buffet-style restaurants that serve up hearty meals for breakfast, lunch and dinner. Nearby Barefoot Landing has additional eateries, plus shops, nightclubs and entertainment theaters. There are also designer outlets and big golf shops on the North Strand, plus a host of after-hours attractions and a year-round calendar of themed events. There are also several full-service North Strand marinas where you can charter a boat for deep-sea fishing or coastal sightseeing. Just north of the state line between the two Carolinas is Brunswick County, the “youngest” of the four Grand Strand golf regions, but by no means the least. The friendly towns of Calabash and Shallotte are part of Brunswick County, as well as the oceanfront communities of Sunset Beach, Ocean Isle, Holden Beach and Bald Head Island. The quiet accommodations here include full-service golf resorts and large single-family homes on the barrier islands. 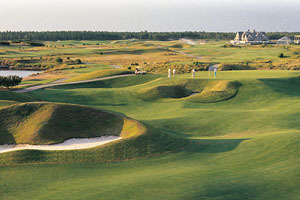 Many of the best new Grand Strand golf courses are located in Brunswick County. Some feature countryside settings with a rural character, while a number of others are set in maritime forests that open up to spectacular waterfront views. Famous designers have left their marks in Brunswick, in addition to some of golf’s best young architects. Their natural styles are as varied as the terrain itself. Calabash is Brunswick County’s “Seafood Town,” with a tempting host of restaurants lined up for your dining pleasure. But while there has been some commercial development in recent years, including new movie theaters, restaurants and retail stores, Brunswick’s main attraction is the small-town lifestyle that the locals have worked hard to retain. So if you want a choice of 24 great golf courses without the arcades, nightclubs and neon lights, then a stay-and-play Brunswick vacation might be a good choice. Besides, the multitude of attractions and entertainments found in the Central and North Strand regions are just a short drive south if you want to enjoy a little day trip or a big night on the town.